My mother used to make this lambs Tongue in Sauce dish when I was a child and it's still one of my favorites.Note: You can change the number of people served by placing your cursor over "Servings". The Ingredients will adjust to the new number of servings. Soak the tongues in cold salted water for 1 hour then drain. Place them in a pan, cover with cold water and bring to boiling, then pour off the water and dry them. Return them to the pot with water to cover and add 2 quartered onions, 1 bay leaf, 2 whole cloves, 3 garlic cloves halved. Bring to a boil, reduce heat and simmer for 2 hours, adding a little salt at the end. 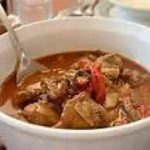 Remove and drain the tongues; strain and reserve the broth for use in the sauce.Remove the skin from the tongues, trim them and slice them lengthwise. In a large skillet, melt 4 tablespoons butter and saute the grated onions and garlic with parsley, thyme and oregano, about 5 minutes. Add tomatoes, tomato paste, wine and reserved stock from parboiling the tongue. Simmer for 15 minutes. Meanwhile, melt the other 4 tablespoons of butter in another skillet and lightly brown the sliced tongue. Add to simmering tomato sauce and simmer uncovered until the sauce boils down to a thick consistency (about 30 minutes). Thanks for the comment, Mark. Yes, in some areas I can see that you may have a difficult time finding the lambs tongues but in So. Cal. we have a number of international markets that carry them….There are a number of sources on-line….Google it!